Create silk Death Head Buttons with this kit, which includes instructions, silk thread, and wooden buttons. Recreate Death Head Buttons popular in the mid-eighteenth century with this exclusive kit that includes instructions, wooden button molds, and silk thread of various colors. 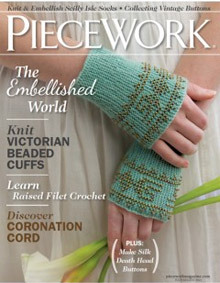 In this issue of PieceWork, knit & embellish Scilly Isle socks, learn about collecting vintage buttons, knit Victorian beaded cuffs, learn raised filet crochet, discover coronation cord, and more! This issue of PieceWork dives into the history of Death Head buttons. Evident as early as the mid-sixteenth century, Death Head button making became a popular cottage industry north of Dorset. Popular until John Aston invented the button-making machine during the Industrial Revolution, these silk buttons were adorned by lords. A growing interest in historical costumes has caused another resurgence of Death Head button making. Today, whether as collectibles or a craft project, Death Head buttons continue to captivate! Each kit contains one 1 inch, one 3/4 inch, and one 5/8 inch wooden button, for a total of three wooden buttons. Kreinik Silk Mori® is a premium 6-strand, 100% pure spun silk with a delightful softness and creamy lustre. This Death Head button kit contains six 5m skeins of thread in 1116 Dark Christmas Red, 5073 Light Country Blue, 5014 Medium Navy, 2013 Light Gold, 3013 Light Coral, and 4203 Light Sage. *colors may vary slightly from what you see here. Create your own Death Head Buttons with this exclusive Needlework Traditions Kit!